Hamburg, 18 March 2011. On 8 May 2011 Coca-Cola celebrates its 125th anniversary. On this occasion, the company reveals its recipe for success, if not his secret formula. In an electronic press kit, the beverage company prepared extensive photographic and text material and takes the reader on a journey through past, present and future of Coca-Cola. In the press section of the website, the Coca-Cola eMag is available for download. Happy birthday celebration starts with the Coke Day Started the anniversary year, Coca-Cola Germany is a large-scale campaign to Kurt, the crate. Happy Day on Coke, 7 May 2011, ushered in the birthday celebration: With the slogan "celebrate now! 125 years of life thanks joy! "Coca-Cola, thousands of employees from all over Germany with 1.25 million free-tasting iced with consumers. 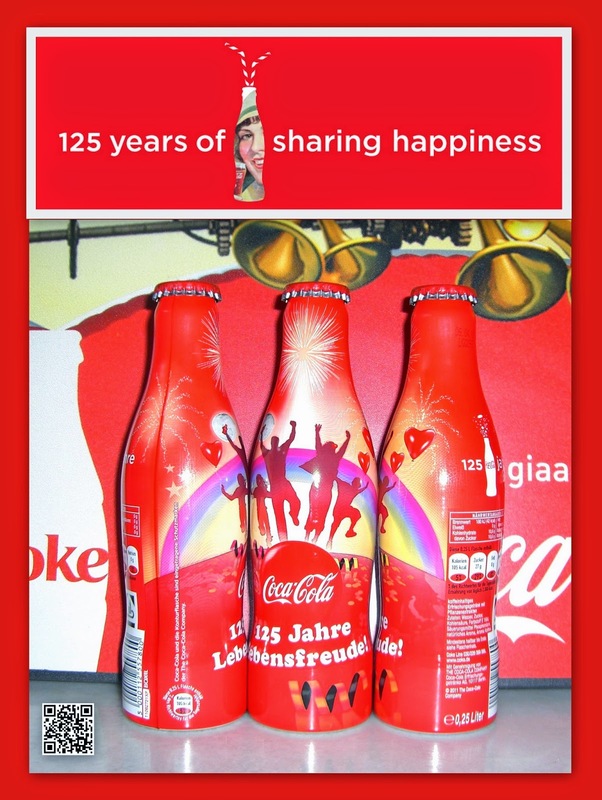 Even at the POP holds Coca-Cola as a surprise to its consumer ready: From May 2011 to the buyer 12 x 1.0 liter returnable crate receive a thank you to one of 5 million Coca-Cola glasses 125th Birthday. Furthermore, with selected trading partners also planned raffles for travel to the corporate headquarters to Atlanta. The out-of-home market is supported by Coca-Cola by strong promotions like the "125 Years of Combo Meals" campaign, in which there are over 350,000 aluminum bottle design in the anniversary as an encore. 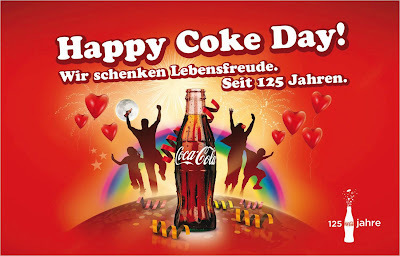 The entire "125 Years" program is a comprehensive, powerful media package to the side: Just in time for the birthday on the 8th May starts about an online promotion, the launch of "MeinCokeBonus.de", the new online loyalty platform (formerly known as the "Coke Fridge") applies. The birth of a global brand John Stith Pemberton, a pharmacist at the 8th May 1886 in Atlanta developed a syrup for headaches and fatigue, he has no idea that he the foundation stone for a world brand sets. Mixed with soda water comes from the Coca-Cola recipe, a refreshing drink that is within a short time a big hit with consumers. For only $ 2,300 buys the entrepreneur Asa G. Candler two years later, the rights to Coca-Cola. He believes in the brand and founded in 1892 in Atlanta, The Coca-Cola Company. To accelerate the proliferation of the drink, he forgives bottling licenses to independent licensees, which make up today a large share of global success. Robert W. Woodruff, president of the company since 1923, takes over Candler's vision: Coca-Cola will be available everywhere, with the motto "within an arm's reach of desire". Coca-Cola in Germany: Skeptical economists, Fanta and Max Schmeling In the "Essen distributor of natural beverage" 1929 leaves the first German Coca-Cola bottle, the bottling plant. The local hosts are automatically skeptical at first, the sale is in the starting year for just 5840 cases. Ten years later-under 50 in factories with annual sales of 4.5 million cases of operation. During the Second World War is the production of Coca-Cola to a standstill due to lack of raw materials. It is creatively designed and Fanta: An-fang made using whey, it is now one of the most popular world-Orangenlimo gonads. After the war, Coca-Cola is growing rapidly on in Germany and will receive in the 50 prominent growth: discovered on a visit to the U.S. boxing legend Max Schmeling, his penchant for the "brown shower" - 1957 he took over as concession-holders filling in Hamburg. Ten years later, in the Federal Republic of Germany for the first time sold a total of 100 million cases of Coca-Cola in one year. After the Wall fell refreshed Coca-Cola, the people in East Germany. On 9November 1989 to be even a single passage in the wall only a few hours, 70 000 red and white Coca-Cola cans distributed. Coca-Cola gives vitality to the country reunified in 1997 at Christmas time: First go here too the famous Coca-Cola Christmas trucks on the road. Coca-Cola today: Global soft - produced locally In Germany, the company now offers over 70 products. The Coca-Cola Ltd. - 100-percent subsidiary of The Coca-Cola Company - together with the Coca-Cola Ltd., which fills the house and sells the beverages, the German Coca-Cola organization. 99 percent of the products are manufactured in the country, that is "produced here, drunk here." Sustainable future With its integrated sustainability strategy, "Live the Future" raises Coca-Cola for the future. The company has seven areas of action identified ¬, where it has set itself ambitious targets and takes responsibility for society and future. In the summer of 2010 Coca-Cola has published its first sustainability report ¬ documenting the activities of the company. With this look ahead, Coca-Cola also guaranteed for the next 125 years a lot of joy. Coca-Cola Singapore throws the ultimate birthday bash! On May 30th Coca-Cola Singapore invited friends and partners to attend a special VIP party to celebrate the 125th anniversary of the world’s most well-known brand. The event venue – MONU – was turned into a Coca-Cola wonderland for the evening, with floor-to-ceiling Coca-Cola decorations, including a 4m high Coca-Cola art mural! Guests arrived in style wearing their best Coke red attire and were welcomed by Coca-Cola General Manger, Antonio Del Rosario. Singapore songstress Michaela Therese emceed the celebrations and dazzled guests with a medley of popular Coca-Cola songs. Thirsty guests refreshed themselves with Coca-Cola Cocktails and enjoyed a sumptuous buffet of American themed food, from mini wagyu burgers to hotdogs and popcorn! Guests were also given the opportunity to view a series of Coca-Cola heritage exhibits which were especially flown in from the USA for the event. The highlight of the evening was the launch of the 125th Anniversary Commemorative Stamp Set. Coca-Cola General Manger Antonio Del Rosario unveiled the stamp together with Singapore Post Executive Vice President Wong Hok Siong. Each guest took home a personalized Coca-Cola photo as a memento of the event, as well as a bag of limited edition Coca-Cola goodies. This box set is given by a famous blogger in Singapore - Yong Wei. Thanks you for writing to alubottle Customer Support Department. My name is JL and I appreciate the opportunity to assist you regarding your question. We monitor our email very closely to provide you with the BEST service possible. Simply because " we are collector too ! " This blog is intended to showcase the author's personal collection of Coca-Cola memorabilia, and to provide information regarding Coca-Cola in general. This blog and the author has no connection whatsoever with The Coca-Cola Company or it's subsidiaries. The author makes no claim against any trademarks, logos, brand names, slogans, jingles, advertisements or commercials featured in this blog. Copyright © 2019 redlabels Inc. All Rights Reserved. Designated trademarks and brands are the prope. Theme images by molotovcoketail. Powered by Blogger.